Last week, I received a delightful package in the mail. 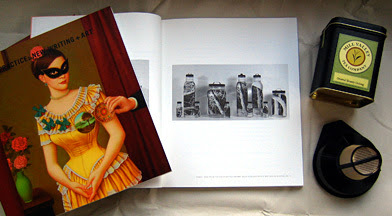 A simple brown cardboard box yielded these treats – loose leaf tea, a tea strainer, and five copies of the journal, Practice: Art + Text, which includes reproductions of my series, Bottle Dreams. As a participant in the journal, I receive these gifts plus a small stipend. I have enjoyed sitting down with my hot tea feasting on the literature and images published here. In particular, I love the interview with Alec Finley and his discussion of “letterboxing.” Alec has planted wooden boxes in the landscape, each containing a “circle poem.” Directions are made available to those who would like to find them and they become a hiking destination. Each box has a “keeper” – a local friend who plants the box and caretakes it. Alec is currently half way to his goal of creating 100 of these around the world. I love this idea of planting art in the earth to be discovered as a hidden treasure. I am also honored to be in such good visual company in this journal. Paddy Sutton’s absorbing photographs of the ocean are made more haunting by his statement in which he reveals that each of these locations marks the death of a ship and its crew during World War II. Colette Calascione’s paintings (one is featured on the cover of Practice) are wonderful surreal explorations that blend human figures with the animal, and composite references to art history and natural sciences. Aaron Cruse’s pinhole photographs are marvelous in the way they inscribe a circular photograph in the center of a black field that leaves the impression of looking through a peephole or tunnel at the outside world. You can enjoy these images and texts yourself by ordering a copy of Practice at www.practicejournal.com.